For those who love to bake with Spelt flour, here is a pretty versatile biscotti recipe. Switch up the add-ins to create seasonal or holiday flavours. You can also just omit the coffee flavour if you just want a plain cookie base. Enjoy! 2- In two bowls, mix the dry and wet ingredients. If you have to heat the honey in order to make it liquid, add it very slowly to the wet mixture while stirring to avoid cooking the eggs. 3- Add the wet to the dry ingredients. Mix gently till just combined then incorporate the add ins. Stir an other few turns. The batter should be firm but quite sticky. 4- Flour a large surface (cutting board or counter top) and turn out the batter onto the flour. Keep your hands floured as well. Divide the ball in half and shape into two long logs. The size really depends on how you want your biscotti to turn out. Itty bitty? Or big giant ones? 5- Place logs on a baking sheep lined with parchment. Flatten the logs so they look like long rectangles a little less than 1 inch thick. 6- Bake for 20 minutes. Let cool for 10 minutes. 7- Drop the oven temperature to 275. 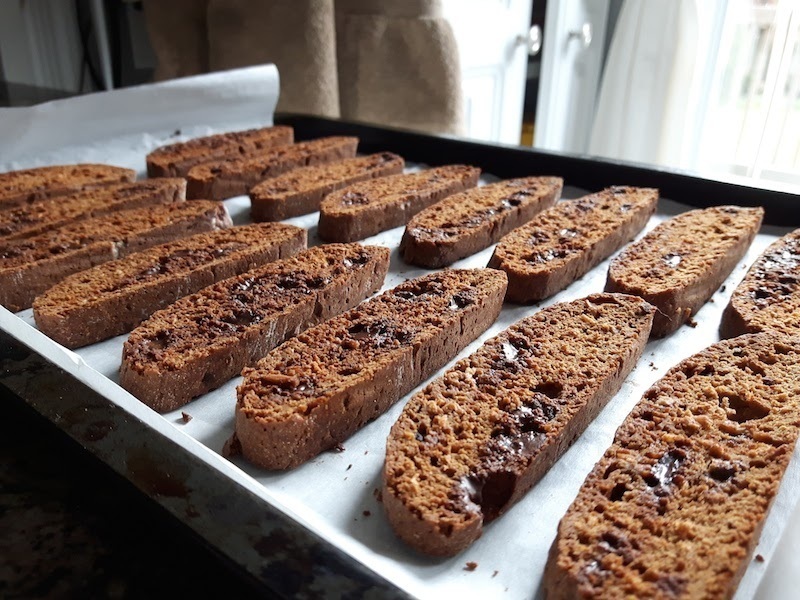 8- Slice the biscotti into 1/2 inch thick pieces using a bread knife and arrange the pieces onto a couple of lined baking sheet. 9- Leave in the oven until the cookies are dried out. Occasionally flip them. This is about as specific as I can be. 10- Let them cool then serve with coffee. Yum.